Genuine fake, there to keep someone else off the ballot. This ruse brought to you by the Electoral Tribunal and behind-the-scenes power brokers who would never admit it. From his Twitter feed, numbers as of December 5, 2018. In late November, the Electoral Tribunal was by its own records caught publishing false totals about who had submitted the most petition signatures to get on the ballot as an independent presidential candidate. The magistrates who represent the political partigGes had listed legislator and former attorney general Ana Matilde Gómez in first place, the secretive Dimitri Flores in second and former legislator and Bonlac dairy scion Marco Ameglio in third. But actually third place was held by attorney and Christian anti-corruption activist Roberto Lombana. A week or so later, after a hue and cry, the tribunal corrected the figures and pleaded insufficient staff for the false press release. Lombana? He’s an actual independent and, although he’s an Evangelical, lacks the ties to the pastors and churches behind the Alianza party or who were part of Ricardo Martinelli’s political operations past or present. Beware of applying US political standards and stereotypes to Evangelicals here. Sometimes it matches, including with US-inspired anti-gay activism by many born-agains here. But corruption has been a divisive issue among Evangelicals here, especially controversies revolving around the Templo Hosanna mega-church. Unlike that institution’s Reverend Álvarez and San Miguelito’s mayor Reverend Cumberbatch, Lombana is unencumbered by such baggage and is possessed of apparently valid anti-corruption credentials. But Lombana has never held public office, something that might be twisted into a pitch to the voters but would likely make him a highly dependent president if ever he gets to the Palacio de las Garzas. Ameglio? He’s one of these wandering politicians who would make public office part of the family business, who wandered from the Solidaridad party and its aftermath, then in and out of the Panameñista Party long enough to be its leader and then to be ousted as such by Juan Carlos Varela. That party worships its late founder Arnulfo Arias but notoriously treats former leaders badly. The conventional wisdom is that Ameglio on the ballot would peel off votes from the Panameñista and Cambio Democratico parties. The man has to date issued no compelling reason beyond belief in himself for voters to trust him. If there is to be a general backlash against incumbent legislators, will that apply to former legislators as well? Coriat: Why do you brag that you do not collect money from your sympathizers? What makes you so different from others who have money? Flores: It’s not that one has money, it’s that one has to work. Coriat: We all work, but we may not have the same income. Flores: So why do they get into this? Coriat: Do you think that the one with money becomes president? Flores: … One who does not show that in his life he has been able to succeed, and that he has been able to save $ 100 thousand in its 40 or 50 years — hello? What message are you giving me about succeeding in what you did in your own life? What are you going to do with us? Coriat: But how do you measure personal success? In money? Flores: That’s how you have to prove it. Coriat: Show it how? In money or in what? Flores: Where are you? Did you get over it? Coriat: I do not have money, I can’t run for president? Flores: Has a 45-year-old person in this country not been able to save even $100,000? Thus spake a man with no visible means of support, no record of any sort of activism in politics or other spheres of public life, no stand on any of the issues that affect this country, no discernible campaign team or base of support — just these nearly 80,000 signatures that he has submitted to the Electoral Tribunal. 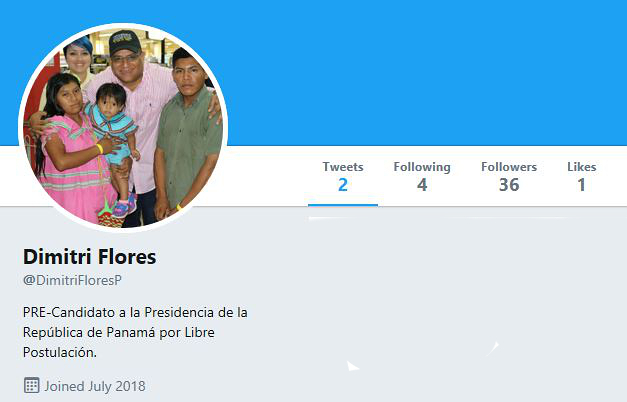 Flores is a placeholder, a creature of someone else, of another political force, fleetingly in public life to keep some other independent off of the ballot. It’s a corrupt position created by the political parties, via the Electoral Tribunal which represents them. Gómez has a record in public life. It might be expected that some will focus on the cases as attorney general (David Murcia Guzmán, Odebrecht) and as member of the legislature’s Credentials Committee (most complaints against Supreme Court members) that she did not touch. The actions that she did take against the looting of the Ministry of Education during the Torrijos administration and against hoodlum magistrate Alejandro Moncada Luna as a legislator will probably get more attention. The question will be whether she would err on the side of attacking corruption, or on the side of maintaining an inevitably corrupt and long-running non-aggression pact among political parties and branches of government. That, and which privileges the Motta family might derive or maintain by virtue of her presidency. So is everything carefully engineered, from the propping up of Ricardo Martinelli’s Cambio Democratico party (including by maintaining candidate immunity for its presidential nominee Rómulo Roux) to manipulation of independent candidacies blocked or allowed through arbitrary rules or their non-application? Remember that this was the norm in Noriega times and not only did its chief practitioner not go to prison after the invasion, she became a law school dean. Will such foreign powers that have intervened in Panamanian elections in the past, the United States and Brazil, do so again? Is somebody in some fashion angling for Chinese participation, and would China deviate from its usual correct diplomatic aloofness from other countries’ internal affairs and swallow that bait? Figure that the allegations that someone is someone else’s agent will generally fall short of reality. There will be a window of opportunity for alliances. The Partido Popular, successor to the center-right Christian Democrats, supports the Panameñistas and José Blandón. MOLIRENA will probably support the PRD. Alianza might go somewhere or just stay as is — they are nothing if not opportunists and their natural ally, Cambio Democratico, is likely to be crushed into minor party status. Parties may not form alliances that put independents who remain independents on their tickets, but they may offer an independent who drops such a bid a candidacy under the party banner in exchange. Independents might take on another independent as a running mate. Getting down to the independents seeking lesser offices, the same three candidates only rule is being applied, the Electoral Tribunal is throwing people off the ballot over bogus residency allegations and all sorts of the usual suspects are running as independents because the parties are so discredited. Perhaps the most prominent among the new “independents” is Evangelical pastor and Cambio Democratico mayor of San Miguelito, Gerald Cumberbatch. Next articleDo blind people have better hearing?